Two University of New Brunswick (UNB) doctoral students and a professor of computer science received top awards recently at IBM’s 26th Annual International Centre for Advanced Studies Conference in Markham, Ont. UNB was the only university to be recognized for excellence in three categories. 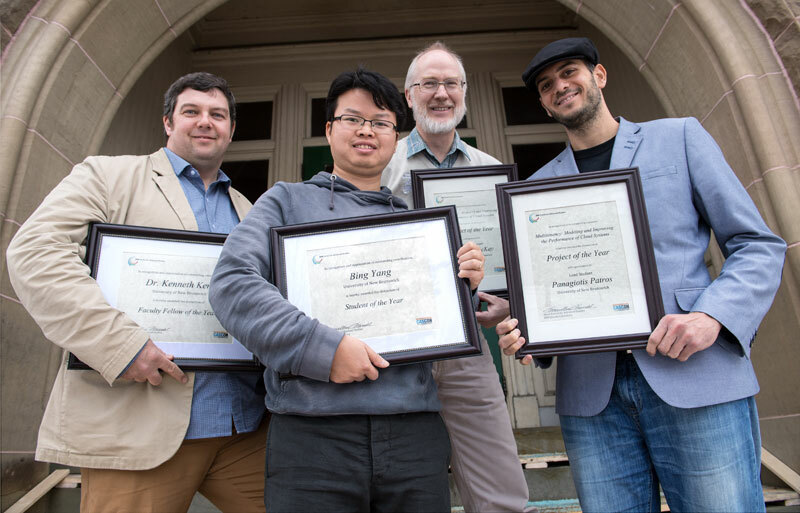 PhD candidate, Bing Yang, was awarded Student of the Year for his work on synchronizing access to data, allowing multiple accesses to data at the same time without compromising accuracy. “Bing is a hard-working student who has shown real dedication to his work,” says Dr. Kent, director of the IBM Centre for Advanced Studies – Atlantic and a professor in the faculty of computer science at UNB’s Fredericton campus. The IBM Centre is a research-based institution dedicated to promoting and cultivating collaborative research between IBM and UNB. Since 2010, graduate students, doctoral students, research assistants and faculty members have worked to improve the Java Runtime Environment, the foundation of many of the tech giant’s software products. Funding support provided by IBM through its worldwide IBM Centre for Advanced Studies program and the Atlantic Canada Opportunities Agency through the Atlantic Innovation Fund program are integral to the success of the centre, as well as contributions from the New Brunswick Innovation Foundation. Mr. Yang was introduced to UNB’s work with the centre and Dr. Kent while he was working in Beijing. He decided to move to New Brunswick to work on this project and pursue his PhD at UNB. He has published three papers, with another currently under review and is hoping to defend his thesis at the end of this year. He currently has four disclosures in progress for IBM patents – for a company to identify four different pieces of a student’s work as intellectual property that they want to protect is almost unheard of. Project of the Year was awarded to a team from the centre for “Multitenancy: Modeling and Improving the Performance of Cloud Systems,” led by PhD candidate Panagiotis Patros (MCS’14). Mr. Patros’ research enables many programs to simultaneously operate on the cloud without sacrificing their security or efficiency. Mr. Patros and research assistant Dayal Dilli (MCS’13), who was hired by IBM in Fredericton while working at the centre, created a mathematical model that measures and predicts the performance of these programs. Others involved in the project include: Dr. Kent; Stephen MacKay, senior research assistant in UNB’s faculty of computer science; and IBM developers Michael Dawson, Peter Shipton and Tom Watson. Mr. Patros has published three papers, worked on two patents and produced a technical report for IBM. He will continue his research and has additional papers in progress. Since 2010, he has been involved in 18 projects with IBM Centre for Advanced Studies – Atlantic, published 31 papers, worked on 14 patents that are currently in progress with IBM and supervised 25 graduate students.